Odontogenic myxoma (OM) of the jaws was first described by Goldman and Thoma in 1947. Myxomas of the soft tissue are frequent but intraosseous myxomas are rare and almost always found in jaws. The exclusive occurrence of OM in the teeth bearing regions of the jaws, occasionally being associated with missing and unerupted teeth and presence of odontogenic epithelium indicate its odontogenic origin. The World Health Organization (WHO) in 2003 classified OM as a benign neoplasm arising from odontogenic ectomesenchyme with or without odontogenic epithelium. OM is an unusual benign tumor comprising 3–6% of all tumors of odontogenic origin. OM usually occurs during the second and third decades of life. Females have predilection over males and more often it affects the mandible than maxilla. The mandibular sites most often affected are molar and ramus region, whereas in case of maxilla, the most affected sites are premolar and first molar area. OM is considered as a slow growing tumor with the capability of reaching to a considerable size with no significant signs and symptoms. 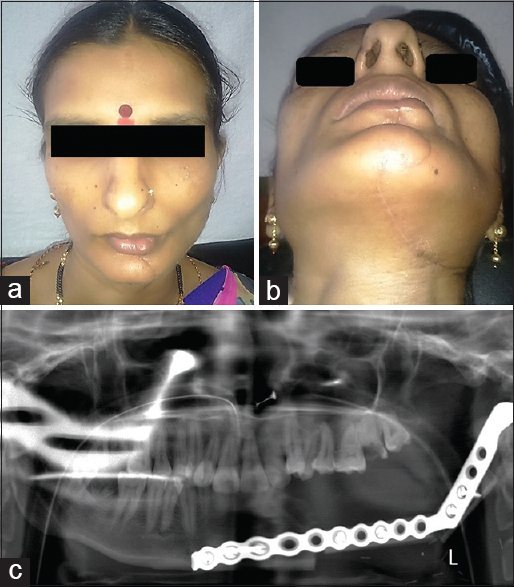 We managed the case of a 30-year-old female patient of OM of the mandible with hemi-mandibulectomy of the left side that proved to be justified owing to lack of any recurrences. Our treatment plan was based on the literature reporting high recurrence rates when OM of such sizes have been treated by conservative approach. A 30-year-old female patient reported to the department of Oral Medicine and Radiology with a painless swelling of the left side of the face since the last 5 months. The swelling was small initially and increased rapidly to its current size. There was no history of any pain or paresthesia and no difficulty in breathing, eating, or swallowing. The patient's medical and dental history was non-contributory. The patient was moderately built and nourished. The patient's vital signs were normal at the time of reporting with a blood pressure of 120/80 mmHg, pulse rate of 76 beats/minute, and a respiration rate of 18/minute. On clinical examination, an extraoral swelling was noticed corresponding to the left body and ramus of the mandible [Figure 1]a. The swelling extended laterally from the left corner of the mouth up to a point just in front of the left tragus of the ear. Superiorly, the swelling extended from a point corresponding to a line connecting the left corner of the mouth and left tragus of the ear, whereas it extended inferiorly up to the left inferior border of the mandible. The swelling was evident on left side of the face [Figure 1]b when compared to the right side [Figure 1]c. The swelling was firm and nontender. A solitary left submandibular lymph node approximately 1.0 × 1.5 cm in size was palpable and slightly tender on palpation. On intraoral examination, an ill-defined swelling was noticed in the left buccal vestibule extending from tooth number 35 to left retromolar region [Figure 1]d. The oral hygiene of the patient was poor. There was lingual displacement of 37 and 38. The teeth number 35 and 36 showed normal vitality response. There were root stumps with respect to 37, whereas 38 had grade III mobility. Benign tumor of odontogenic origin (ameloblastoma) of the left mandibular region was given as provisional diagnosis with a differential diagnosis of odontogenic myxoma. For further investigations, orthopantomograph (OPG) was made which showed features of diffused mutilocular radiolucency with honey comb and tennis racket appearance involving the left body and the entire ramus of the mandible [Figure 2]. There were apparent signs of root resorption with respect to 36,37 and 38. The radiolucency which measured approximately 6 cm × 4 cm extended anteroposteriorly from the mesial aspect of tooth number 35 to the posterior border of ramus, and superioinferiorly it extended from the mandibular notch to the lower border of the mandible. The multilocular radiolucency also involved the alveolar process thereby causing displacement of 37 and 38 in the occlusal direction. Angular multilocular compartments separated by straight septa forming triangular, square, and rectangular spaces were seen on OPG. Septa going beyond the periphery of the lesion can be seen clearly on OPG (arrows), indicating the invasiveness of the lesion. For understanding the extent of the lesion, the patient was scanned using Cone Beam Computed Tomography (CBCT) (Planmeca Promax 3D MID (Planmeca Finland) at 90 kvp, 8 mA, with an exposure time of 13.55 s and 20.2 cm height × 17.5 cm diameter scan volume. CBCT revealed a mixed radiolucent-radiopaque internal pattern of the tumor with buccolingual cortical expansion (arrows) on axial section [Figure 3]a with buccal and lingual cortical plate perforations, straight sharp septa (arrow) on coronal CBCT section [Figure 3]b, and sharp straight septa going beyond the periphery of lesion (arrow) on sagittal section of CBCT [Figure 3]c. Other findings were also in accordance with the OPG findings. Hence, we arrived at a radiographic diagnosis of odontogenic myxoma. 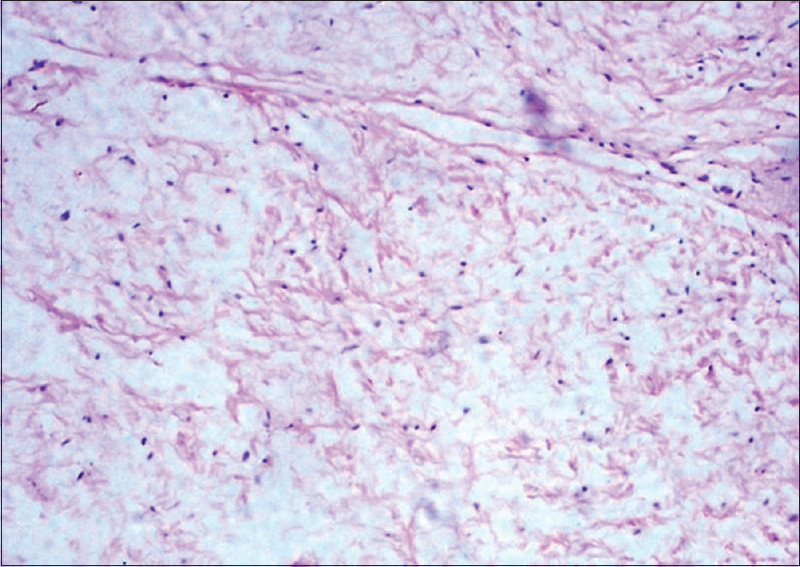 Incisional biopsy was undertaken, and sent for histopathological examination, which showed randomly arranged spindle-shaped, stellate, and round cells in a loose myxoid stroma suggestive of myxoma. 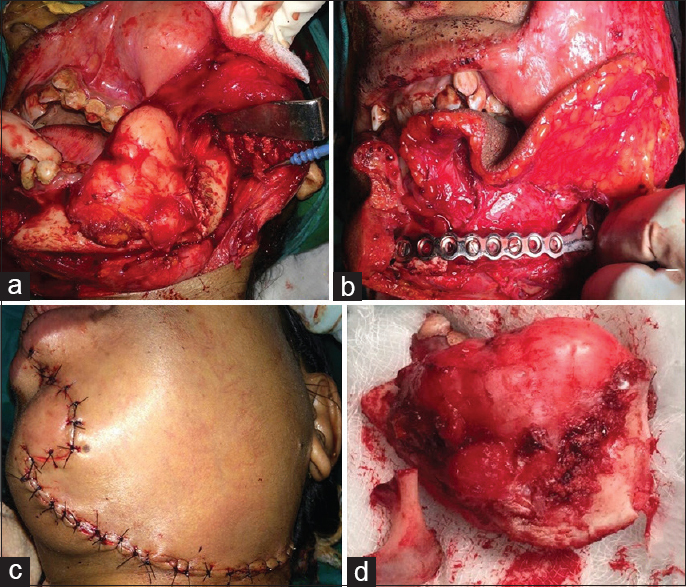 Keeping in mind the destructive nature of the lesion, wide local excision with hemi-mandibulectomy was carried out [Figure 4]a. The reconstruction procedure was carried out by free fibula flap with pedicle and titanium plate fixation [Figure 4]b. The surgical site was closed using 3-0 ethilon suture material, by vertical mattress suture pattern [Figure 4]c. The resected segment [Figure 4]d was sent for histopathological investigation which confirmed myxoma [Figure 5]. The surgical procedure was uneventful and was followed by alternate suture removal, removal of all sutures and removal of cast of left leg on 11th, 14th, and 21st postoperative days, respectively. The patient was discharged on postoperative day 24, and was evaluated after 3 months of the surgical procedure [Figure 6]. The patient showed satisfactory healing with no complications. Odontogenic myxoma (OM) is a benign tumor derived from embryonic mesenchymal elements of a developing tooth including the dental follicle, dental papilla, or periodontal ligament. It begins with a slow growing tumor but can lead to massive cortical bone expansion and destruction of bone at its later stages, implying its infiltrative behavior. The relative incidence of OM in Asia, Europe, and America has been found to be between 0.5% and 17.7%. Various studies done on OM were unable to come to a definite common age group for its occurrence, however, most of the studies have shown increased probability in the age group of 22.7 to 36.9 years. It is rare in children and adults who are over 50 years of age. The patient's age in our case was 30 years and the affected site was mandible, which was in accordance with the available literature. OM has a female predilection, with a male-to-female ratio of 1:1.5. It rarely presents with pain unless the lesion invades into the surrounding structures and results in neurological signs. Halfpenny et al. stated that OM in most of the cases presents as an asymptomatic swelling and can grow to considerable dimensions before diagnosis, as was seen in our case. The patient reported here was asymptomatic despite its large size and locally aggressive behavior. The lesion presented in our case was aggressive despite its mandibular location, which is contrary to the literature, showing more aggressive behavior of such lesions in the maxilla compared to that in the mandible. OM affects mandible more than the maxilla, with mandibular molar regions being the most common affected sites. OM may become symptomatic at later stages because of expansion of lesion and encroaching upon neighbouring structures, and symptoms can be of pain, particularly in maxilla due to its association with surrounding soft tissues. Radiological appearance of OM is usually a unilocular or multilocular radiolucency having well-defined or diffused margin. The size of the lesion and locularity are interrelated. OM lesions which are larger than 4 cm follow a multiloculated presentation, whereas smaller lesions seem to be unilocular in appearance and the presentation is often defined as soap bubble, honeycomb, ground-glass, or tennis racket pattern. This feature is in uniformity with our case which presented with multilocular radiolucency and tennis racket appearance, typical of larger lesions. The interpretation of radiographic features is vital in arriving at a diagnosis in OM. The internal structure of OM usually consists of curved and coarse septa, however when straight and thin septa are encountered, it is considered as the characteristic feature of odontogenic myxoma. The detection of straight sharp septa on either the conventional radiographs or CBCT aids in arising at a diagnosis of OM. Our case presented with similar thin, sharp and straight septae in both the panoramic and CBCT sections, considered as characteristic of OM. Ameloblastoma, odontogenic fibroma, ameloblastic fibroma, and odontogenic keratocyst are among the lesions considered for differential diagnosis of OM, and commonly the diagnosis of odontogenic myxoma depends on the radiographic and histopathological features. Curettage and wide excision have been suggested as the treatment modalities for OM. Treatment options ranging from enucleation, excision, or radical surgery with curettage of adjoining hard tissues have been reported in literature. The studies have shown no cure with radiotherapy alone, and hence, OM is considered to be radioresistant. As OM is not encapsulated and its infiltration does not lead to any destruction of the immediate hard tissues, the risk of recurrence increases when conservative approach is applied during its treatment. These factors help to explain high recurrence rate of OM that ranges between 10–33% with 25% considered to be the average recurrence rate. Hence, our patient was managed with total excision of the lesion and is under follow-up at present. The future use of advanced imaging modalities such as Computed Tomography and Cone Beam Computed Tomography may infer new information regarding odontogenic myxoma lesions with its effect on the surrounding structures. With proper treatment, the prognosis of odontogenic myxoma is good and long term follow-up of cases is necessary, particularly those treated with a more conservative approach. Proper initial clinicoradiological diagnosis followed by corresponding histopathological report helps in arriving at an appropriate diagnosis and aids in devising a treatment modality with minimal recurrences. Thoma KH, Goldman HM: Central myxoma of the jaw. Oral Surg Oral Med Oral Pathol 1947;33:532-40. Li TJ, Sun LS, Luo HY. Odontogenic myxoma: A clinicopathological study of 25 cases. Arch Pathol Lab Med 2006;130:1799-806. Reddy SP, Naag A, Kashyap B. Odontogenic myxoma: Report of two cases. Nat1 J Maxillofac Surg 2010;1:183-6. Imran A, Jayanthi P, Tanveer S, Gobu SC. Classification of odontogenic cysts and tumors – Antecedents. J Oral Maxillofac Pathol 2016;20:269-71. Boffano P, Gallesio C, Barreca A, Bianchi FA, Garzino-Demo P, Roccia F. Surgical treatment of odontogenic myxoma. J Craniofac Surg 2011;22:982-7. 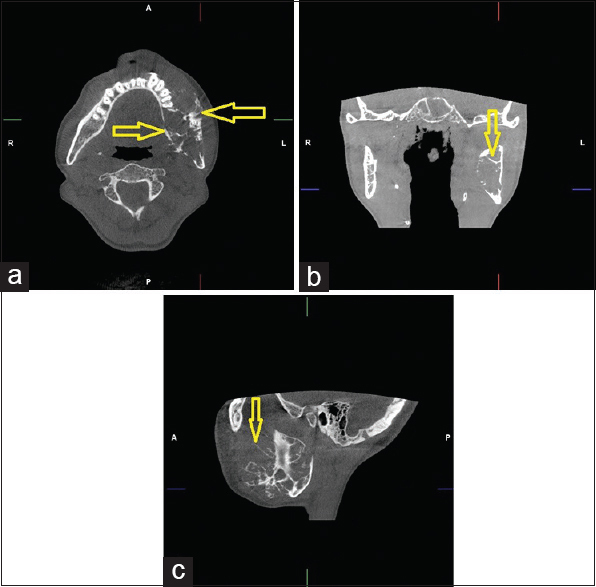 Kidwai SM, Mohan RS, Wadhwan V, Kamarthi N, Goel S, Gupta S. Sunbirst appearance in odontogenic myxoma of mandible: A radiological diagnostic challenge. J Oral Maxillofac Radiol 2016;4:18-21. Noffke CE, Raubenheimer EJ, Chabikuli NJ, Bouckaert MM. Odontogenic myxoma: Review of the literature and report of 30 cases from South Africa. Oral Surg Oral Med Oral Pathol Oral Radiol Endod 2007;104:101-9. Ayrancı F, Ömezli M, Rastgeldi O, Duman A. Odontogenic Myxoma Located in the Mandible: A Case Report. Middle Black Sea J Health Sci 2015;1:25-8. Thabusum DA, Rajesh N, Reddy RS, Ravikanth M, Raju US. Odontogenic myxoma of maxialla- A rare case report. WJPMR 2017;3:282-5. 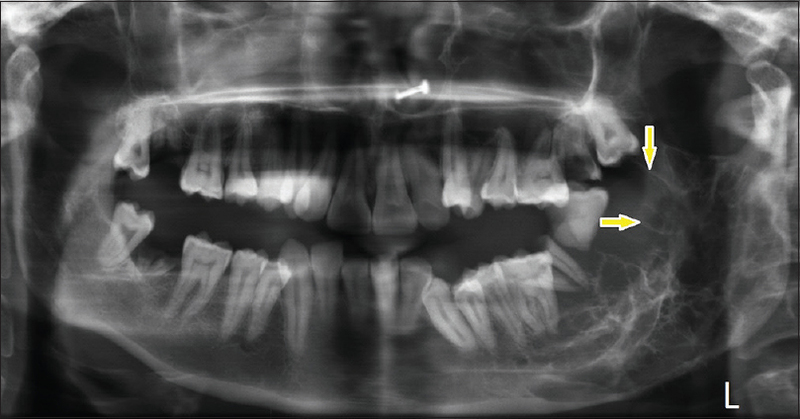 Guzmán C, Torrealba M, Kuramochi G. Odontogenic Myxoma in a Pediatric Patient: A Case Report. OA Lib 2016;3:1-8. Khan SF, Agrawal P, Sur J. A rare case report of myxoid fibroma of maxilla. Quant Imaging Med Surg 2015;5:778-82. Sivakumar G, Kavitha B, Saraswathi T, Sivapathasundharam B. Odontogenic myxoma of maxilla. Indian J Dent Res 2008;19:62-5. Aquilino R, Tuji F, Eid N, Molina O, Joo H, Net F. Odontogenic myxoma in the maxilla: A case report and characteristics on CT and MR. Oral Oncol Extra 2006;42:133-6. Manjunath SM, Gupta AA, Swetha P, Moon NJ, Singh S, Singh A. Report of a rare case of an odontogenic myxoma of the maxilla and review of literature. Ann Med Health Sci Res 2014;4(Suppl S1):45-8. Hernández Vallejo G, Cohn C, García Peñín A, Martínez Lara S, Llanes Menéndez F, Montalvo Moreno JJ. Myxoma Of the jaws. Report of three cases. Med Oral 2001;6:106-13. Halfpenny W, Verey A, Bardsley V. Myxoma of the mandibular condyle. A case report and review of the literature. Oral Surg Oral Med Oral Pathol Oral Radiol Endod 2000;90:348-53. Rani V, Mahaboob Kadar M, Babu A, Sankari L, Krishnasamy G. Odontogenic myxoma diagnostic dilemma: A case report and review of literature. J Craniomax Dis 2014;3:163-7. Higo M, Kasamatsu A, Ogawara K, Shiiba M, Uzawa K, Tanzawa H. A case of a rapidly expanding odontogenic myxoma of the mandible. Oral Sci Int 2015;12:22-6. Dabbaghi A, Nikkerdar N, Bayati S, Golshah A. Rare appearance of an odontogenic myxoma in cone-beam computed tomography: A case report. J Dent Res Dent Clin Dent Prospects 2016;10:65-8. 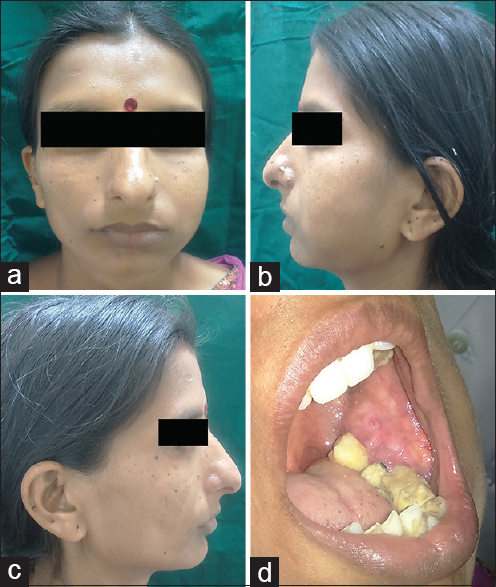 Aditya A, Khandelwal P, Joshi S, Trimbake S, Dighe R. Odontogenic Myxoma of Mandible: Report of A Rare Case. J Clin Diagn Res 2016;10:ZJ01-ZJ02. Rocha A, Gaujac C, Ceccheti M, Amato-Filho G, Machado G. Treatment of recurrent mandibular myxoma by curettage and cryotherapy after thirty years. Clinics 2009;64:149-52. Landa L, Hedrick M, Nepomuceno-Perez M, Sotereanos G. Recurrent myxoma of the zygoma: A case report. J Oral Maxillofac Surg 2002;60:704-8. Leiser Y, Abu-El-Naaj I, Peled M. Odontogenic myxoma- a case series and review of the surgical management. J Cranio maxillofac Surg 2009;37:206-9.